Below is a list of accepted speakers and their talk titles for the 2019 Annual Meeting at UMass Amherst. The meeting will be this 20-22 June. You may register and secure lodging here. My talk will concern the support committees for the Bertrand Russell International War Crimes Tribunal. A Swedish Support Committee was in fact created. The idea of a Danish Support committee originated from a meeting about the Russell Tribunal in Copenhagen in December 1966, when Schoenmann and Isaac Deutcher were present: this was on the initiative of the Danish leftist author, Ebbe Reich, and also several other notable Danish intellectuals. The formation of Dansk Bertrand Russell Råd took place in Copenhagen on 10 January 1967. The only information I presently have regarding a Japanese Support Committee is from a document that looks like it originated from an American intelligence agency, Emergence of Japan Committee for Investigation of War Crimes in Supporting Bertrand Russell War Crimes Tribunals. Those interested in preparing for my talk may read the Klinghoffers’ International Citizens’ Tribunals. I plan to compare Russell and Orwell chronologically but in multiple aspects, including their attitudes to the state. What brought them personally together at the end of World War II, when they did lunch at the Ritz? Both were pro-Labour with reservations, were against religion, concerned about the rebuilding of British and European society, and experts in writing clearly. Prior to 1945, when Animal Farm was published and esteemed by BR, there are but scattered references by GO to BR. In early 1946 they joined with Arthur Koestler to promote a kind of world bill of individual rights with steps to avoid war. When 1984 was ready, Orwell repeatedly sought BR’s commendation first of all. BR’s ultimate judgment was it was too gloomy and did not offer hope. Although Russell changed his view on the nature of propositions and the facts (whether positive or perhaps negative) to which they refer, he remained constant in his defense of the correspondence theory of truth: a proposition (whatever its ontological status may be) is true when it corresponds to a fact. In defense of this theory, dating back to Aristotle, he criticized both the coherence theory of truth and the pragmatic concept. In this paper I will re-examine his early debate with Harold Joachim on the coherence theory, and consider how his objections would apply to a more modern theory, that of Nicholas Rescher. I will also examine his rejection of the pragmatism of William James and consider the extent to which his critique applies to more recent views, especially that of Richard Rorty. I will then consider the prospects of a hybrid theory of truth, containing elements of correspondence, coherence and pragmatism. When most alarmed, voices for peace, rise. Here we listen, with specific attention, to the interpretation made of the implicit causality, as consanguineous with selected and particular events that have elicited actions signally high alert from long-standing peace activists, including Bertrand Russell, E.P. Thompson, and Tony Simpson. All offer us cold fact and stark futures. In the course of a week, in a range of political contexts, we learn of events that although ostensibly distinct in origin, taken collectively, ought to alarm us further. Of course, this can be said of virtually any week, and so we risk becoming numb. However in the first week of April of 2019, for symbolic value alone, the non-monopolistic yet wanton waste of earth resources to explode a domestic target in space and thereby threaten one of the few physical emblems of inter-nation cooperation also in space, is startling. This is in no way unique, in action, nor origin. However, just as “she did it first” rarely carries weight in a school yard squabble, we cannot afford to become complacent to arguments of precedence nor deterrence uttered by others. How shall we respond in our time? What might this reflection produce, and how might the interpretation of implicit causality influence consequent mandates for action? Dorothy Wrinch (1894–1976) was a student of G. H. Hardy and wrote a thesis under the supervision of Russell. She had a career in mathematics and biochemistry, and is perhaps best-known for her work on x-ray crystallography and on protein structure, particularly her cyclol hypothesis. I plan to argue that Wrinch’s corpus, especially her work in mathematics and on scientific method, is emblematic of logical atomist method. I further claim that Wrinch was the first female logical atomist. I will highlight places in her writing where she acknowledges her logical atomist roots. In the 1920s, Russell came to defend a new theory of judgment associated with neutral monism and the causal theory of meaning in a series of works: Analysis of Mind (1921), An Outline of Philosophy (1927) and Analysis of Matter (1927). In 1920, a congress entitled “The Meaning of Meaning” marked Russell’s turn. The title of the congress became the title of a book by Ogden and Richards in 1923, two years after Russell presented his causal theory of meaning in The Analysis of Mind. Wittgenstein refers frequently to both books at the end of 1929, when he certainly read or re-read Russell’s works of the 1920s. This period coincides with Wittgenstein’s visit to Austria and meetings with the Vienna Circle, where Russell’s new theory was the subject of seminars held by Schlick. Wittgenstein discusses Russell’s theory quite systematically in his manuscripts from 1929 and 1930, and presents a critique of Russell’s views on meaning and judgment in his Philosophical Remarks, a collection of remarks that Wittgenstein handed in to Russell and to the College Council in May 1930 in order to renew a grant. I intend to show the nature of Wittgenstein’s critique and what he thought were the implications of Russell’s theory. It will turn out that the new theory, according to Wittgenstein, implies an infinite regress. Moreover, it allows us to judge a nonsense, which was at least one of the objections (if not the objection) that Wittgenstein developed against Russell’s old theory of judgment in Theory of Knowledge (1913). Before doing this, I prepare the background of Wittgenstein’s critique by outlining Russell’s philosophy in Analysis of Mind. Russell and Whitehead provide a uniform solution to many widely discussed contradictions in the early twentieth century in the first volume of Principia Mathematica, among which includes Liar paradox, Berry’s paradox, Richard’s paradox and Burali-Forti’s paradox. The solution they offered is that these paradoxes violate the vicious circle principle, a principle proposed by Poincare in 1905. Despite its simplicity, it took Russell several years to reach this solution. In this paper, I will try to understand Russell’s effort from 1905 to 1910 to solve these paradoxes, in particular the paradox of definability. I will focus on Russell’s intellectual exchange with a Cambridge mathematician Ernest Hobson on the paradox of definability during this period. In the first place, I will outline Russell and Hobson’s intellectual exchange in a chronical order. Then I will analyze Russell’s different attitudes towards Hobson’s solution to the paradox of definability. Finally, I will try to evaluate Hobson’s role in Russell’s attempt towards a uniform solution to contradictions. My paper explores the relationship between neutral monism and structural realism in Russell’s corpus, arguing that these two positions are mutually reinforcing. In particular, I argue that Russell’s variety of neutral monism involves the kind of reduction of physical and mental constructs into some neutral entity that structural realism can provide. On the other hand, I show that structural realism benefits from the addition of neutral monism because it can explain what remains after the physical and mental constructs are eliminated. My argument is that Russell’s adoption of both views in the mid-1920s provided for a more robust conception of the world than each view standing alone by having ready responses for objections against each discrete view. For example, neutral monism benefits from structural realism by being able to explain how physical and mental phenomena arise from this neutral stuff. This process involves the neutral entity exhibiting different properties when it relates to other neutral entities, in the same way that structural realism explains objects and the relations in which they stand. Furthermore, structural realism benefits from neutral monism’s addition to say that the neutral stuff is fundamental, which can help in answering some common objections to structural realism, such as where the causal powers of the structural system are derived. These are just two ways in which these views are interrelated which I develop along with others in my full paper. These interrelations indicate that neither view entails or requires the other, but rather that each view is supported by the acceptance of the other. In this paper, textual evidence is presented to reveal that Wittgenstein’s Doctrine of Showing was lurking insidiously behind his objection to Russell’s multiple relation theory. Central to the evidence is Wittgenstein’s 1913 Notes on Logic in which his ab-Notation is said to be essential to the logical form of belief. Only Showing can explain how Wittgenstein could transform the contingent issue of ruling out non-sense judgment into an issue relevant to logic. Russell’s 1918 Logical Atomism lectures are presented to corroborate the view as are passages found in his 1919 and 1921 work. In Russell’s last statement (Jan. 31, 1970), prepared two days before his death, he expressed support for Palestinians and condemned Israeli “aggression” towards them. Russell’s first biographer, Ronald Clark (1976), found this statement out of character. True, Russell always supported Israel, but, by drawing attention to little-known texts in his Collected Papers and extensive documents in the Archives, we can present a fuller, more nuanced view of the development of his thinking. In the 1960s he moved from concern with easing disputes involving boundaries between states (Israel and Arab states) to recognition of Palestinian refugees. The 1970 statement, while strong, is consistent with his principles: condemnation of nationalism and religious nationalism; concerns about European-backed colonialism; support for refugees (a major interest, 1963–); and defense of minorities against power. A preliminary report on the recent acquisition by MacMaster University of bound proofs of Volumes I and II of Principia Mathematica. What can be deduced about these books and the process of production of Principia from these corrected proofs? Most of this talk will be concern suggestions that are far too speculative to commit to print. Did Russell send them to Henryk Dziewicki in May of 1913? The dealer told us that they were taken by Dziewicki’s family to Australia, then somehow they showed up in Sydney in the collection of a mathematics professor, and that is where our dealer in Copenhagen bought them. Or so he said. Readers of the forthcoming sober article by Linsky and Blackwell won’t have nearly as much fun as those who come to hear the paper in person. The famed photographer Edward Steichen conceived the idea of a photographic exhibit that would capture all facets of human life. Entitled “The Family of Man”, it first was shown in January of 1955 at the Museum of Modern Art in New York City, and thereafter traveled throughout the United States and then much of the world. 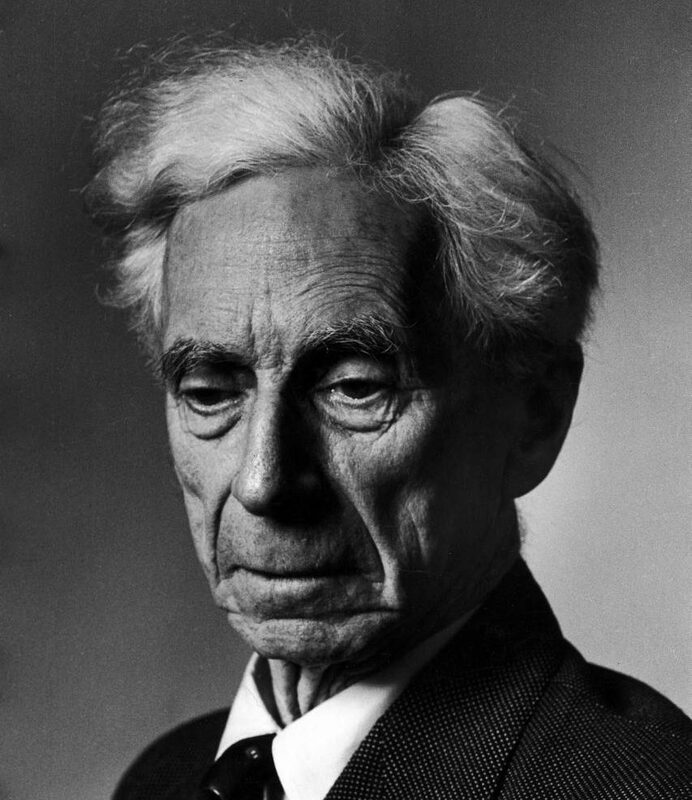 The purpose of the exhibit, Steichen said, was to demonstrate “the essential oneness of mankind throughout the world.” In this talk, I will look at the role which Bertrand Russell’s commitment to the abolition of nuclear weapons played in the exhibit, especially his emphasis on how the hydrogen bomb made the complete destruction of “the Family of Man” a distinct possibility for the first time in human history. In a letter to Ottoline Morrell of 1916 Russell confesses that Wittgenstein’s critique of June 1913 on his Theory of Knowledge stopped him doing philosophy. His 1918 lectures “The Philosophy of Logical Atomism” were, in fact, an attempt to come back to philosophy by way of reconsidering his projects of 1912–1913 and also Wittgenstein’s “Notes on Logic”. It is well known today that the concept of truth-making was first used in print in this sense in Russell’s 1918 lectures. He also used his concept in “On Propositions” (1919), and in Analysis of Mind (1921). In the upcoming years, it was widely used by the early and middle analytic philosophers (C. D. Broad, John Wisdom, Stebbing, Schlick, and J. L. Austin after the WWII). Unfortunately, Russell did not know that in the summer of 1915 Wittgenstein abandoned this conception. In other words, in his 1918 lectures he introduced a term that was already out of date. Only in An Inquiry into Meaning and Truth (1940, pp. 202ff.) he stopped speaking about truth-making and used the term “verifiers”. Truth-making remind him very much the pragmatist theory of truth he sharply criticized in 1907–1908. In 1914, Russell expounded a phenomenalism in which physical objects are constructed from perceptual data by the method of extensive abstraction (Russell, 1914, repr. 1917). In the same year as this essay was reprinted, Russell defines physics as it “is said to be an empirical science, based upon observation and experiment.” (Russell, 1917). Thus, in 1927 in his book The Analysis of Matter and in part of the “Perception and Physics”, Russell adopted the causal theory of perception, according to which physical objects are inferred from percepts (Russell, 1927). Through these steps, Russell became closer to the physics logic. However, according to Russell, the intrinsic nature of events is unknowable, but some knowledge of structure can be inferred from the structure of percepts. The Copenhagen interpretation may show a pragmatic situation in dealing with external world. Stapp showed that “Throughout Bohr’s writings there is a tacit acceptance of the idea that the external world exists, and that our physical experiences are caused, in part, by the course of external events” (Stapp, 1972). In a recent research in an analogy for the foundation of quantum mechanics, Sanduk (Sanduk, 2012, 2018a, 2018b, 2018c) shows that the external world may be perceived in different forms, according to the used light properties. Accordingly, in a certain case we may get some knowledge of the structure of the external world. This partial knowledge is appeared as an abstracted information (complex function). Thus, the quantum mechanics may be a result of some knowledge of the external world. This concept may be is same stream of Russell. My talk will be about Bertrand Russell’s unique and longstanding commitment to the principles of socialism. Marrying a staunch defense of individual liberties with a penetrating indictment of capitalist society, Russell embodied a laudably independent-minded political position in the twentieth century—critical of both the militaristic plutocracies of the capitalist west and the oppressive autocracies of the communist east. The talk will cover Russell’s core contributions, and the lessons his worldview offers even today. When World War II began in 1939 Russell was teaching in the United States where he would remain until mid–1944. Colette was living in the English countryside. Although both had opposed the First World War they supported the Second. Colette called it “the life or death of the world.” In 1940 Colette left England for Finland. In 1941 she fled to Sweden when the Continuation War began. There are 21 surviving letters which Russell sent to Colette from the autumn of 1939 to December 1944. It is more difficult to get an exact count of her letters because she wrote different versions of the same letter but there appears to be around 30 that were sent. I will discuss the issues that both of them faced during the War, the support they gave to each other, as well as the difficulty of sending and receiving letters during wartime. Russell is well-known for having raised serious objections against some of the most influential among his contemporary philosophical figures and movements. Russell’s critical outlook would set the tone that would become characteristic of what would, half a decade later, be described as the analytic ‘revolution in philosophy’. This ‘revolution’ has often been conceived in terms of the ‘overcoming’ or ‘elimination’ of rival approaches, in a manner which may be traceable back to Russell’s critique of his contemporaries. The typical (though controversial) story that is often retold about the analytic ‘revolution’ pinpoints its beginnings in Russell and Moore’s rebellion against British Idealism. Russell himself positions his (and Moore’s) rejection of idealism among a variety of anti-idealist projects developed in the first decade of the twentieth century. Russell divides these into two camps that are not mutually exclusive. The one camp includes those approaches which reject idealism from a technical standpoint, among which Russell considers not only the work undertaken by himself and Moore, but also the works of Gottlob Frege, Alexius Meinong, and Edmund Husserl. The other camp involves the approach developed by the pragmatists (which are also connected to the prior camp) and Bergson. Their overcoming of Idealism is not primarily motivated by technical developments, but rather, as Russell notes, by a dislike for ‘the regimentation and orderliness involved in a world created by logic’. Russell further differentiates the two camps by noting that the former camp is motivated primarily by academic concerns (showing Idealism to be false), while the latter’s projects would appeal to a broader public. In Russell’s account, the popularity contest was won by Bergson who ‘outbid [pragmatism] in appealing to the same tastes’. Indeed, at the time Russell met him during his 1911 visit to Britain, Bergson was at the peak of his international fame. Following this meeting, Russell read Bergson, all the while complaining about his work in various letters to Lady Ottoline Morell. In this correspondence, Russell notes that Bergson’s lectures ‘are reported in the daily newspapers—all England has gone mad about him for some reason’. It is, among other things, a need to address this ‘madness’ that would prompt Russell’s subsequent criticisms of Bergson. In the following year, Russell would produce a (wittily) scathing review of Bergson’s book on laughter, as well as a paper offering a series of objections to Bergson’s philosophy in general. This chapter will examine Russell’s reading of Bergson, outlining the critical arguments Russell directed against his opponent’s anti-intellectualism. Regardless of whether Russell’s objections to Bergson’s philosophy were correct or fair, they were to a large extent the reason for the subsequent subsiding of interest in Bergson in the English-speaking world. Russell’s History of Western Philosophy was a commercial success and generally popular with the overall public. However, it was not well received by professional philosophers. Recently Kenneth Blackwell, Giovanni de Carvalho, and Harry Ruja have compiled a list of over 150 reviews of the work, most in non-academic presses, but also several in professional philosophy journals. In this paper I examine a selection of both kinds of reviews and shed light on Russell as a historian of philosophy and on how he was perceived in the 1940s and 1950s. Among the many philosophers who reviewed the work were Charles Baylis, Isaiah Berlin, C. D. Broad, Martial Guerroult, C.E.M. Joad, H. J. Paton, Karl Popper, Joseph Ratner and Paul Weiss. Several philosophers also wrote reviews in the non-academic press. Bishop Butler begins by making the search for truth unashamed the business of his life. But what is truth? What is power? Why do we so fear shame? The truth he seeks is the rule of life, and the main statement of the rule is that virtue consists in following nature. Butler then attempts to demonstrate our human nature can be analyzed as consisting of various affections, superior principles such as self-love, benevolence, and the love of God, obviously corresponding to “the Great Commandment,” and conscience, which may also be called the rule of life since it is by the order of nature the supreme principle. Russell does not treat of Butler at length, but he says enough on the topics to make clear how much he is at odds with Butler. This paper takes up some general points of comparison between Russell and Butler before focusing on the consequences of the teapot example. The rule, or at least guide to life, also turns out to be probability. The guide is probable because we, unlike God, are not omniscient. Russell accepted probability as the guide to life and attributed it to Butler in his review (1922) of Keynes’ Treatise (1921). There is no denying that Russell’s teapot has done much to inform the general public regarding the importance of appeals to the burden of proof both in general and specifically regarding philosophy of religion. The burden of proof matters because so many of the great problems of philosophy have not been resolved by the evidence and argumentation provided in centuries of disputation, so if there is any practical relevance or implication to the question at hand, if there are actions that are grounded in the argument, they can only be resolved by appeal to the burden of proof. This paper raises some skeptical doubts about the efficacy of Russell’s teapot, not for serving tea or providing entertainment to the public, but for resolving the question of whether there is a God, so far as the resolution of that question matters in the daily affairs of busy people.